The Washette Bathroom-Aid is, as it's name implies. a bathroom accessory. It's a multi-purpose, hand held sprayer, attached to the toilet system, using a flexible hose to provide water in either a spray or stream mode to improve personal and environmental hygiene. The 300mm long wand makes it the perfect hand-held bidet and a blessing for carers. The Bathroom-Aid is beneficial for not only for personal hygiene of a patient but also for environmental integrity. It offers the most efficient way for cleaning bathrooms and toilets at home, nursing home, hospital, pre-school or medical clinic. Hygienic for promoting family health everyday. Clean and easy to get cleaned without contamination. Absolute control when cleaning. Comfortable for use from front or rear while seated. Long wand for washing without getting hands wet. Powerful for cleaning without touch of water. Safety secured by the additional in-line-valve. Excellent for remote cleaning with the 1.5m long flexible hose. Durable for use with the high quality and systematic structures. Good for spot removal left on the bowl and saves water. Convenient and instant water supply with pushbutton control. Quick separating of parts for a fast change of wash functions. Supplied with an Australian Standards certified backflow prevention device. The long wand makes the Bathroom-Aid ideal for carers or those responsible for washing others, especially efficient with comodes. For personal washing after toilet, just use the Bathroom-Aid from the front and push the button. Move the spray nozzle around. It's all under your control with the long Bathroom-Aid wand. With adjustable strong water spray, you don't have to touch the water. The Bathroom-Aid can be used from behind for assisting children. With Bathroom-Aid, cleaning babies and young children no longer a messy job for mums and dads. Washing dirty pets can be done easilly. Cleaning the toilet bowl, the sink, the whole bathroom is easy. There are many things you can do using the versatile quick separable components. 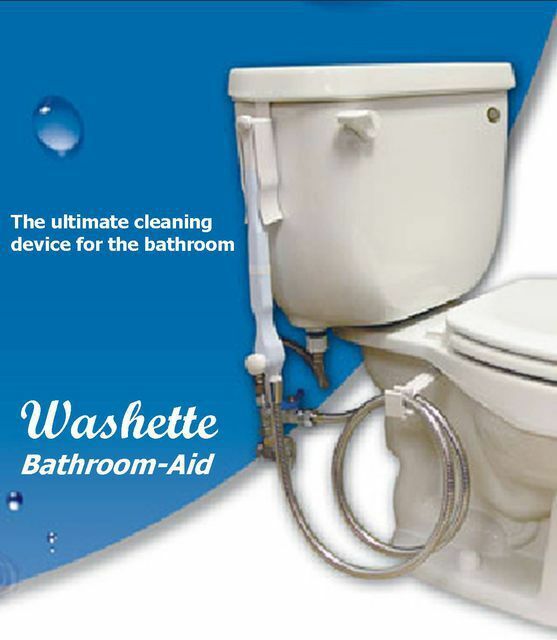 The Washette Bathroom-Aid has a patented shut-off valve which supplies instant water without leakage. Bathroom-Aid with three quick separable components supplies water in spray or stream mode for use as a bidet or cleaner. Controller of the Bathroom-Aid supplies soft water stream with a simple pushbutton. Automatic Shut-Off Valve of the Controller allows you instant water supply. Lengthy Extension Wand allows you remote water supply and easy movement in the bowl. Slim Spray Tip allows you easy placement into the bowl. Angled Spray Tip supplies pressurised water spray in the right angle for cleaning. Lengthy 1.5 metre Flexible Hose enables you to clean remotely. Reinforced Triple Layered High Pressure Flexible Hose is provided for complete flexibility. In-line valve allows you to adjust or shut-off water flow manually before and after use. 1/4 Turn Ball Valve ensures to turn on and off the water supply fast and easy. T-Adapter enables you to connect to any existing water line. Backflow prevention device (complies with Australian Standards) is included for complete protection. Chrome Plated Metal Adapters are to ensure safety, durability, and beauty. Holder with Bracket enables you to keep in order on top edge of the cistern or on any flat surface. Hose Rack is easily mountable on the existing fastener of toilet seat for the hose arrangement.